Progressive Charlestown: Do RI Republicans stand by their man? Do RI GOP Candidates Stand By 47% Comments? are senior citizens. At least 5,000 millionaires pay no taxes. reluctance to release his tax returns. So far I haven’t heard anything from the Republican candidates running in Rhode Island. I left Dave Layman, from Brendan Doherty’s campaign, a voicemail. I just now left a message for Mike Riley, who is running against Jim Langevin. Patrick Sweeney, spokesman for Barry Hinckley, said he would email a statement by 3 pm, though I haven’t gotten anything from my inbox yet. She actually posted her statement to her website, but she also has a history with the idea that 47 percent of the population doesn’t pay income taxes. Read the Courant story for details. Would someone please let me know if the GOP congressional candidates from Rhode Island decide to speak up about this issue? Since both are accused of being too conservative for Rhode Island, and because Romney’s comments shined a light on what many liberals and moderates fear most about conservative Republicans, I think we should know what Brendan Doherty and Barry Hinckley think of Romney’s comment. 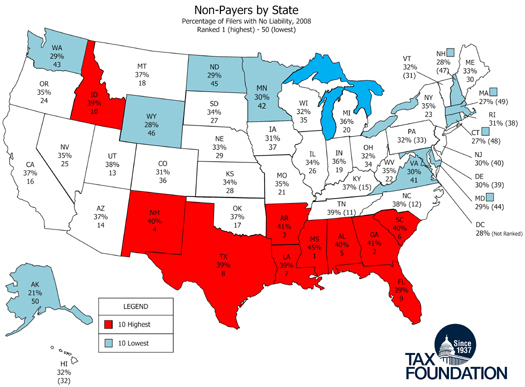 EDITOR'S NOTE: this chart shows the Top Ten states for non-payers of federal income tax in red. All but New Mexico (which is a toss-up) are also "red" states for voting Republican. The blue colored states have the FEWEST non-payers of income tax. Seven out of ten of those states went for Obama in 2010. Romney's statement about the political demographics and tax payments is FALSE.